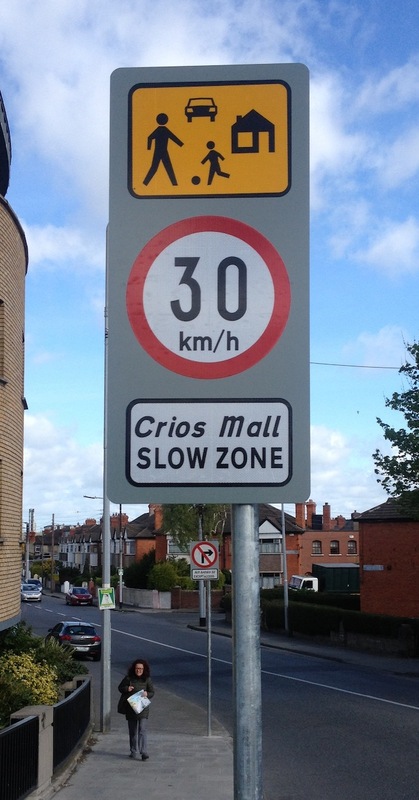 Dublin City Council has recently imposed a speed limit of 30kph in large parts of central Dublin – basically any street which is not regarded as a main artery. This is supposed to protect pedestrians and children at play. In order to explain this to the general public, the council has produced another one in its ongoing series of baffling signs, and spent a lot of money erecting them all over the city. We’ll leave aside the awful typeface used for the Irish language text for the moment. That’s a post for another day.